What are the optimal settings for mileage detection? One of the most-used features in Hurdlr is the mileage tracker. Whether you're using auto or manual tracking, follow this checklist to make sure Hurdlr's mileage tracker is working as effectively as possible. Tap Settings > Hurdlr > Location > Always. It's important to note that on iOS 11, you now have an option to select app location services only 'While in Use'. Selecting 'While in Use' will prevent Hurdlr from tracking mileage. Tap Settings > Security & Location > Location > On > High Accuracy. 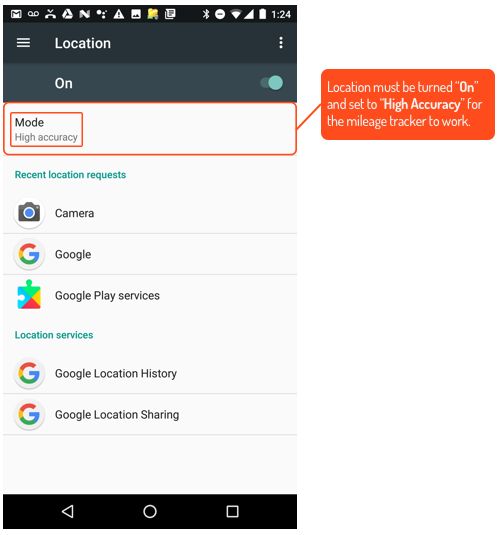 The "High Accuracy" setting on Android devices must be selected to track mileage. 2. Is Hurdlr running in the background? Make sure the app is open and running in the background for the best mileage tracking experience. 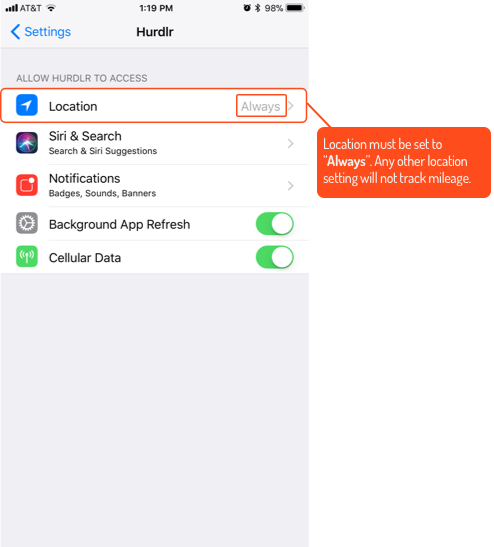 Additionally, if you force-quit Hurdlr, mileage tracking will not work effectively. Force-quitting is done by double-tapping the home button on iPhone or square button on Android and swiping away Hurdlr. 3. Is Wi-Fi turned on? Even when you aren't connected to a Wi-Fi hotspot like a coffeeshop, your mobile device uses Wi-Fi hotspot proximity (if you live in a city, you could pass by thousands a day) to register location information. Wi-Fi is far more efficient on batteries than other location sources like GPS. You can turn on Wi-Fi for both iOS and Android devices by going to Settings > Wi-Fi > On. 4. Have you installed the latest Hurdlr update? We are constantly improving Hurdlr to provide new features and address bugs. Make sure you have the most recent version of the app installed. 5. Are you currently logged in to Hurdlr (and is it the correct account)? Make sure you’re signed in to Hurdlr and your account's email address is correct to help make sure all your mileage is tracking as expected. To verify you're signed in, open the Hurdlr app – if you see the login screen, you're not currently signed in, so enter your username and password. To double-check the account you're signed in under, tap More > My Account and Settings > see the email address at the top of the screen. Check for any misspellings, as it's possible you may have accidentally created a second account in the past. 6. Do you have power/battery saver mode enabled? Having power/battery saver mode turned on may inhibit the mileage tracker's ability to determine location/distance in the background, so we recommend turning it off while tracking mileage. Followed this checklist and still have an issue tracking mileage? Reach out to our Customer Success team (click the blue chat icon in the bottom-right corner) for one-on-one help.